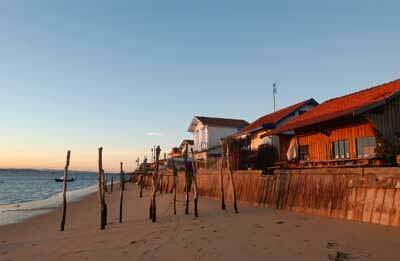 Located in Piraillan harbour the shack enjoys a view of the Pyla Dune and the idyllic backdrop of Bird Island. 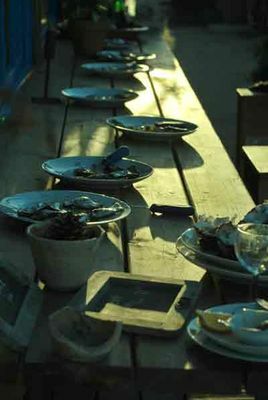 In a heritage oyster farming village shack n°57 blends perfectly with its environment, the welcoming flowers on the deck, the friendly "ambience" and the top quality produce all guarantee a few delightful moments of relaxation and enlightment. In the summer, a genuine natural show from sun to moon rise. In the winter in one of the only heated shacks in the bay, come and discover the "Tavern" ambience, enjoy a glass of wine, the constant buzz of life and the produce, fresh from the oyster beds, all in an enchanting atmosphere. 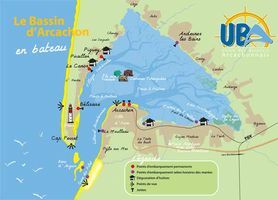 Accessible by boat even at low tide (GPS coordinates : 44.7075405 -1.2216045).